When it comes to process cooling, few industries rely on the application of heat as much as the sintering process in powder metal manufacturing. With temperatures in the “high-heat” section of a sintering furnace reaching several thousand degrees Fahrenheit, the parts must be dramatically cooled before they can be handled safely by operators. Sintering is a process by which metal particles are chemically bonded and formed by heat and pressure without reaching the point of total liquefaction. To accomplish this, powdered metal and alloy mixtures are compacted into near-net shapes, typically using a high pressure press. 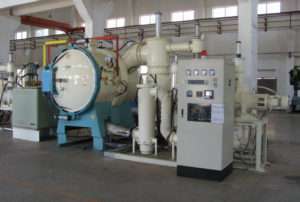 The compacted material must then be placed in a sintering furnace to improve the bonds and harden the material to the desired final specifications. To expedite the temperature reduction process, cooling towers are commonly used to circulate water through a jacket that cools the air surrounding the part. Unfortunately for sintering, metalworking and other industrial processes, the most common type of cooling towers are constructed of galvanized steel and so are susceptible to corrosion and rust problems that can increasingly require ongoing maintenance, often causing expensive process downtime along with repair costs.